Hi, I bought this board from Amazon.de. Is it normal it power up the display only when it is connected to USB? The previous one (also GT2560 revA+) was working without any USB connection. I have a Pro B printer. which printer you use? prob or proc or prow? I would like to use the GT2560 to drive an aluminium I3 Pursa but the Merlin software when loaded displays ultimaker and has the wrong step size can you help please. Just finished assembly of the I3 Pro W and the extruder motor will not turn. 1. Plug extruder into x driver and it turns. 2. Take stepper driver from x axis into extruder slot on control board it doesn't turn extruder. 3. Extruder stepper plugged into x axis slot on control board and it doesn'turn x anymore. 4. Even tried Extruder 2 slot with the original extruder driver and the x axis driver. Neither work there. I believe i have a bad control board and stepper driver for the extruder. Please advise. Hi Mike ,you can contract to our tech for help ,and if broken by quality you can contract the related sales . Hello, I bought an MeCreator 2 here and saw, that there is the "b" version of the GT2560 build in. Does this version also support 24V for the Heat bed? Btw, what are the differences between GT2560 an GT2560b? Hi Mathias ,you can place the order online and remark to the sales the board used on Me creator 2 and the sales will arrange the correct one to you .They are in different ,using on different printer ,pls note with thank. Hello! i just messed up something! i put this character in the printer's name on marlin firmware: "▲" and the printer would never get through the Marlin's bootscrean again! what can i do? thank you!! Hi Jose ,The triangle character is a illegal character. So I suggest you use another name. 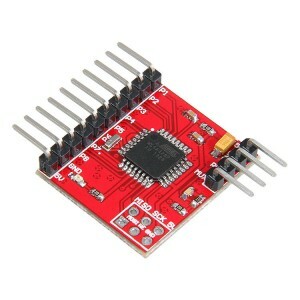 What pin is used for the servo connector is that Pin 32 or pin 13? Hi Richard ,could you pls email to me so that i can reply the detail to you with some picture . What is the pin for for the servo connector? Is that 13 or 32? Hi Zina, The bed levelling problem has been solved but now other issues have applied, i just send a support request to the technical staff. Hi Johan ,That's good and you can ask our technican for more help. 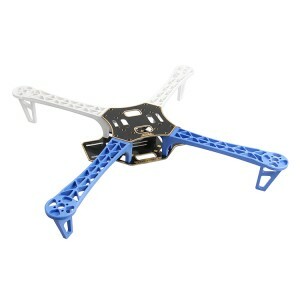 Hi, I just assembled the Rostock mini GS2 Pro. Love the machine btw. After connecting everything to the main board i noticed a little problem. The probe for bed levelling is the same micro switch as used on the axis end stops, only difference is the L shaped probe, so far nothing to worry about, two wires can be connected... the problem is that on the print board is a Z min and a 3d touch connector. which should i use? the 3d touch has a 3 wire connector so obvious i suspect it wil have a positive, a signal and a gnd pin. i'm a total newbie on the frontier of 3D DIY kits so here i could really use some help. Hi Johan,For G2S Pro, you should use the L shaped probe. When using a 24V power supply with this controller board, is 24V applied to the extruder heater ports? Hi Benjamin ,if you want the controller by 24V ,you also need make sure the extruder and the heat bed are 24V,or the controller will be burnt out by 24v . 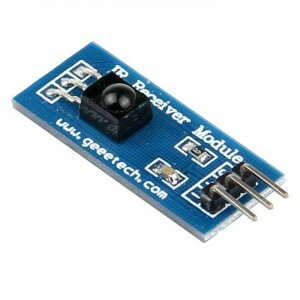 Hi Orie,you can see below: 1.you can refer the firmware of I3 Pro B as this link: http://www.geeetech.com/forum/viewtopic.php?f=10&t=17046 2.using the Switching Power Supply by 12V ； for the connection you can refer to the manual of pro B : https://www.geeetech.com/Documents/pro%20B%20building%20instruction.pdf Hope it can help you. Hello, is it possible to adapt 3 extruders in this board? Hi Denis ,sorry that it cannot. uhmm...where can i buy the cable set for this board since i'm using RAMPs+Arduino board and it has different plug especially with the stepper motor wire, it's using Dupont jumper wire plug. Can the 3 pins added for 3D Touch be used to drive an micro servo instead? Hi Peter ,have you contracted to the related sales for sending the connector pins? hello Linas,ask our techncian for help and will feedback to you. Is it possible to connect a 12v power and a 24v power supply at the same time? 12v for logic/fans/hotend/steppers and the 24v for the hot bed? Hi Just incase I blow a fuse where can I get some replacments? I have a Geeetech Full Aluminium 3d Printer with a Sanguinololu board. I want to upgrade the Sanguinololu to this board. 1. 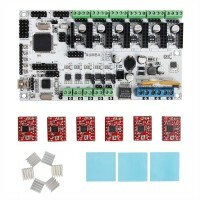 Will I need new stepper drivers or can I use the ones from the old board. 2. Are there any changes needed top be done to the firmware to make this work on my printer? 3. Where can I get the latest firmware for this board and my printer? 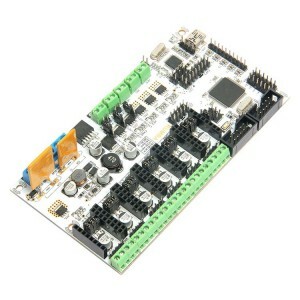 I notice that this board is included with the Geeetech Aluminium Pro printer. Will that firmware work with my printer? 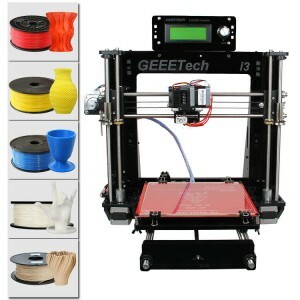 1.You can use the old ones if they're all working fine.2.You can download the following firmware from here:http://www.geeetech.com/forum/viewtopic.php?f=20&t=17046 (Prusa I3A 2560.zip, I3_pro_X.zip,Marlin-PI3_Pro_B.zip)The three firmares all fit your printer. 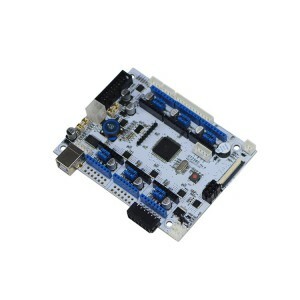 Hi I wnat to purchase Gt2560 board, please let me know it support MKS-TFT28 lcd screen? Also please which psu require for main board? Hi,Shiva I'm afraid it doesn't support the LCD you mentioned,and about tht PSU,the operating voltage is 12V-24V; double power supply design feeds for heatbed and logical part separately. Hi, I had this board for about 2 weeks and ran it on stock a4988. It ran fine, but I had drv8825 and when I try them at about .6v the motors make more noise and the board heat so much (I have 2 60mm fan on it) and I put an heatshink on the hot part. The drv are not very hot but the black thing between the second extruder driver and the .150 thing become crazy hot. Can I broke the board by printing like that or do you have an idea about what is happening ? Hi,did you plug your drvs in a wrong direction?Cuz its plugging direction is different from A4988...And when you plug drv,you should change the subdivision of the motor(yes it the jumper caps,drv with one cap and A4988 with 3 caps as you saw).Finally,A4988 is recommended. Hi,Bob 1.Did your extruder motor work before?You can try swapping the extruder motor cable with cables of other motor,sometimes the motor cable is broken though it rarely happened. 2.About the engine wiring diagram,you can find it in the "Users Manual of GT2560.pdf" on this page. ok i keep on getting time out when trying to upload to the bored.. i can see it with pronterface and print with it. just wont let me upload the firmware. Did you disconnect the board to the Repetier host or other soft ware you are using? if so, please disconnect it first and try again. Hi, I have this board, and I would like to know if there is a firmware update, which date was released. Also, I'm trying to print ABS and I need to heat the bed at 110ºC, but everytime I try to do it, I burn the fuse belonging to the heated bed. How can I fix this? Please check your voltage input,I think you can adjust it to a smaller value. If you have any further queries, please contact technical support technical@geeetech.com. I have asked this question without getting an answer. Q:What is the warranty on the boards. I ask this because I have had my heater bed connection melt and burn weld it's plastic to the base of the plug and melt the solder and fall off the board and that a possible transistor is the culprit, and that I also have a noticeable scorch/burn mark on one of the (4 pin) power lines on the main connector,from the power supply, so could also be the power supply. Hello Frank, the warranty is 180 days. We have changed the bed heating connecter into the blue one as you can see in the picture, the melting will not happen again. Regarding to the burn mark on the power supply connector, pay attention that never hot Plug andUnplug the wire. Was anything else replaced because i can see a light brown mark on the track from the transistor. As I stated in my comment I have a scorch mark on one of the lines from the power supply at the plug on the board and was concerned that it might have been a power supply issue than from a plug issue. mainly from the fact that the track on the board from the transistor to the plug was also slightly burnt in a light gold tint, making it look like was getting hot as well. I am trying to supply you with as much information as I can from what I can see. I have recently ordered a board of a seller on ebay as of no shipping cost, but that it is of the older type of board, and that I have concern of this happening again but wonder if just replacing the plug will be enough to solve it as I could do that my self with a soldering iron. I bought another board from an ebay seller but that it was void of firmware. I am wondering if you have a proper copy for this board for I3 as I received a copy a long time ago from someone at Geeetech, that I uploaded it via arduino software and nothing responds as it should, do I have to mnually configure the firmware, or is there a copy that is preset for i3 on the Geetech forum/site,, as I cant get to the forum as I dont have a pass word and my main password seems not to work , /I was wondering if any one at Geeetech can email me a proper copy please. This controller board can be used in a printer D -bot CoreXY ? 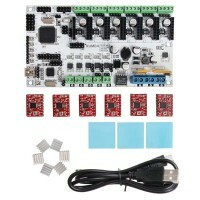 i do not know the printer D -bot CoreXY, but most control board are compatible. If this control board has the feature you need on that printer,you can use it. Hi All. 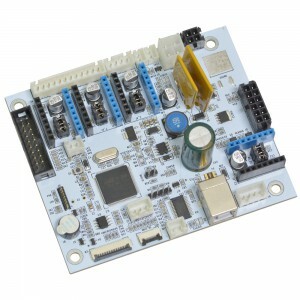 I am using a GeeetechGT2560 controller board, with Davinci 2.0 hardware. My Extruder extrudes well under manual control, (from PronterFace or Repetier-Host), but, during prints, its stops extruding, after a few layers and starts clicking or skipping. A) I have tried several times to adjust the potentiometer on the extruder motor driver board, A4988, finding the right point between when the motor stops turning, when the power is too low and the motor stops turning when the power is too high. As I mentioned, it works smooth under manual control. I still cant get more than 2 or 3 layers to print, because, somewhere after the first few layers, between 2 and 5, the extruder motor starts skipping. B) I have tried printing in PLA at 185 and 190 degrees. The clicking starts either way. C) I dont believe the motor is getting overheated, as it starts clicking after just a few layers being printed. It only feel warm to touch at this point, often, even room temperature. D) The Da Vinci 2.0 has two extruders. I have tried both motors, with different cogs and idlers, both with same results. Hence, I am sure the motors/cogs are not faulty. 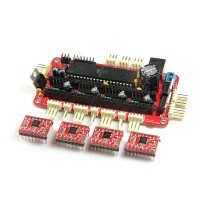 E) I have tried two different Motor Driver Boards, A4988's, on the same output on the GT2560. Same results. F) I cleaned the nozzle several times, confirming each time after cleaning, that PLA flows freely, through the nozzle, under manual control. G) I have tried slicing with Slic3r and Cura. Print preview shows XY movement and X axis and Y axis move accordingly. I have no idea what to try next as I am out of ideas. Any and all help is greatly appreciated. I have spent a month now, trying to install this GT2560 and still cant get a print done. Hi, sorry to tell you that it can not be used on this board. Why not? You have to connect "+" to 5V on board (lower left side of atmega chip, next to C37). Signal to SIG, ground to GND (on temp JST slot). 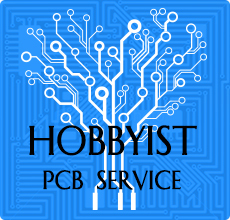 You also need to desolder R23 for 1st head thermocouple, R21 for 2nd and R4 for heatbed. These three resistors are located below temp JST slots. If need only for head, desolder only R23. 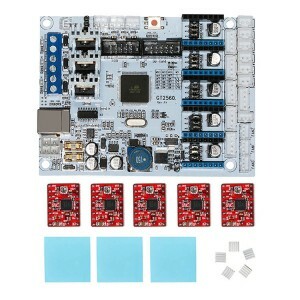 It is exactly mega + ultimaker board. Even names are the same. It will void warranty for sure. HELLO can someone send me the latest marlin for purse i3 pro b with heatbed? board: GT2560 thankssss N.M. I have a Geeetech Prusa i3 Pro C DUAL EXTRUDER printer from you, it has a GT2650 controller, Could you please send me the latest version of Marlin firmware that you supply for this configuration? My Email. is shana@shaputer.com Currently Both extruders won't extrude at the same time. Only Extruder1. Anything I plug into Extruder2 connection doesn't work. I've changed the ramps 1.4 on extruder 2 several times. Ramps shows the right voltage. I've tried 2 boards so far. My original board worked fine, but quickly got so hot at the power cable that it burned the connection on the board. Hi please check your e-mail, firmware has been sent to you. You can contact this e-mail technical@geeetech.com for technical support. Thank you. Hello Quentin. Sorry, but i can't find your answer to my question about FAN_PIN number for GT2560 board in Marlin software in my e-mail jazzmaker@yandex.ru. Please, resend me again. Thanks. Hi Alexander, sorry that I'm not professional in technical problem. You can contact this e-mail technical@geeetech.com for technical support. Thank you. Can you please send via e-mail pin definition for my GT2560 for Marlin software. I choose MOTHERBOARD=7 as described in manual, but I can't control fans via REPITER SW interface at all. My e-mail jazzmaker@yandex.ru. Thanks in advance. Hello, it has been sent to you. May I have the firmware for the prusa I3 with the gt2560, please? Hello good Morning! I bought a GT2560 electronics for my 3D Printer MendelMax 1.5 with a estrusor . If possible please send me the correspondete firmware. Can I use the latest version of the Arduino IDE to write the firmware? 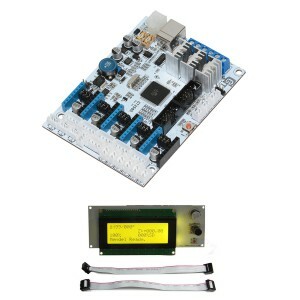 Hello our firmware is used for certain combination of our control board and our printer. You can modify the marlin firmware yourself if you need to use it on your printer. Sorry for the late reply, we spent our Chinese New Year vacation for a couple of days. please leave your e-mail address here, and I’ll send it to you. Hello Michael,please leave your e-mail address here, and I'll send you several pictures for illustration to help you. Hi Steve, sorry to tell you that GT2560 can not be used on your printer. I am looking for the type of Connectors used for the motor- and fan connectors. Are you selling these also? not for retail, if you need large quantities, please contact our sales Rannie. Hi I still dont understand things about power supply. One power supply I can connect 24v for my 24v bed and one power supply is for everything else so I can connect it to 12v is that correct ? Hi Peter, hot bed and logic circuit part are separate in power supply. HI, ANYONE HAVE THIS PROBLEM? : step1: i turn on my laptop -_ i connect the GT2560 by USB cable to my laptop -_ my laptop recognize the motherboard as USB device -_ i open repetier-host (configuration COM and baudrate OK)-_. i turn on my Prusa I3X ...and the connection is lost :c step 2: the same procedure, but, i disconnect the power supply of my laptop (working only with battery) ...and all works fine. wtf? is a kind ground problem??. anyone have the same situation?? Hi, what is the operating system of your computer, Windows OS or Mac OS? i use win 7. the was fixed connecting the printer on other electric point. But,... wtf? anyone have the same situation?? also, i have to mark the 'fase' and 'neutro' of all points electric. Hi. All stepper motor input the same functionality (I want use it with 4 independent axis and 1 extruder)? Yes they are, but you have to do modification yourself if you want to use it with 4 axis. Hello. Please send me firmware for Geeetech Prusa I3 X 3D printer. Thank you. Hello,please tell me your main board type and leave your e-mail address. I installed Repetier Firmware (Motherboard: Ultimaker 1.5.7) into your GT2560 (mounted on a GT2 Delta 3D printer). The firmware works except the 2004 controller (with config : "Smartcontroller for ReprapDiscount on Ramps"). Could you send me the custom configuration to run the GT2560 with Repetier Firmware please. Repetier Firmware is better for auto-level and with Repetier Host. Thank you. Will this work in a CTC dual-extruder printer? What firmware is pre-installed and what firmwares are supported? Hello Joe, yes it can work in a CTC dual-extruder printer. Pre-installed firmware is Marlin firmware, but it is designed for Geeetech's printer, so there may be some differences between it and that of CTC. About the firmware you can consult the original factory for help. Hello Evan, would you like to tell me which printer you bought?I need know the type of your printer in order to send the corresponding firmware to you. Hello, Can this support dual extruder? 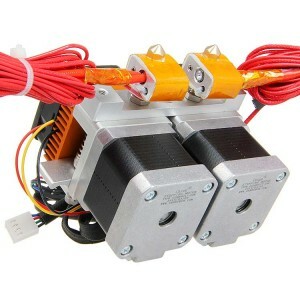 Expects says it support 5 steppers, but Z axis on prusa requires 2 stepper motors. yes, it support dual extruder, from the picture you can see there are 6 slots for steppers,and the two z axis steppers are in parallel-connection,so you just need 5 A4988 for the steppers. you can check the schematic diagram in wiki. What type is fuse for power supply unit GT2560 - located at left corner . they are white - 2 of them. and where I can order ? Hello Roman, they are resettable fuse, their specification is SMT5*10, one of them is the type of 0154010.DRT, 10A/125V, and its location on the machine is F1;the other is the type of 0154015.DRT,15A/125V,its location is F3. You can buy them in local hardware store or order them online. If you run the board at 24 volts are the fans regulated to 12v, or are they just 24v too? Considering this as a replacement for the RUMBA board, and that seems to be the only thing (other than 3rd extruder) missing.